It’s true: people on the Internet like to make up baseless drama, twisting quotes and stirring false tension in search of clicks. As such, we’ve fabricated some potential rivalries of our own ahead of the 2019 Monster Energy NASCAR Cup Series season — based entirely on drivers’ Twitter interactions with each other. First, we mapped out a list of every possible driver-to-driver Twitter mention combination and arranged them all into a massive 31-by-31 table — the lone exclusion Twitter-less Paul Menard, since he’s probably brooding in a dark forest thinking about the end of Sunday’s Advance Auto Parts Clash instead of tweeting selfies. Using Twitter’s advanced search, we manually scoured each of the 961 combinations, marking whether each driver made even a single tweet at any point mentioning each of their fellow drivers. A time-consuming process? You bet. But, it helped us — the pot-stirrers on the Internet — do what we do best: artificially concoct conflict. For that reason, it was all totally worth it and absolutely necessary. 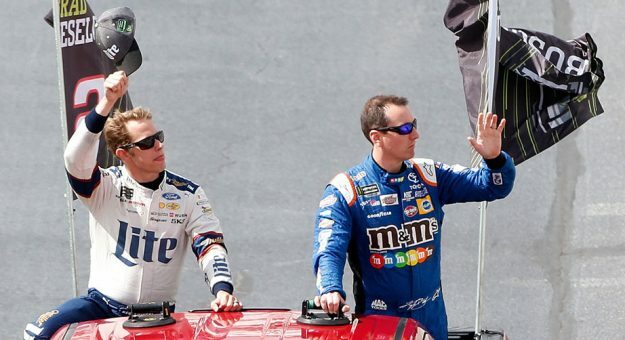 Will any of this result in the next Brad Keselowski vs. Kyle Busch relationship? Nobody knows. Let’s first take a look at who’s popping up on everybody’s radars. Typically, the most popular driver is one determined by fan votes. However, thank to our data-gathering exercise, we’ve determined which drivers are favored among their peers, at least when measured by Twitter mentions. And, yeah, that goes both ways. The results of analyzing this particular set of data seems pretty accurate, considering the infamously difficult-to-pass Ryan Newman was mentioned by less than half of his fellow drivers on Twitter. 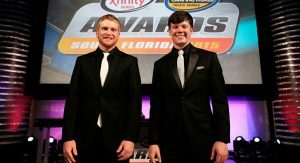 It appears like the 2019 rookies — Matt Tifft, Ryan Preece, and Daniel Hemric — have their work cut out for themselves this season to attract the attention of their fellow drivers. Sometimes, it’s nice to try to be friends with as many competitors as possible. Based solely on Twitter mention data, these are the drivers most likely to cast a wide net reaching out to competitors on Twitter. Nothing wrong with that. Some drivers keep to themselves. Twitter mention data showed us a handful of drivers who prefer to lie low — still, maybe not as much as Paul Menard, though. Maybe he’ll join Twitter someday and become a total chatterbox. Call us Taylor Swift, because baby, now we’ve got bad blood. Here’s where there’s high potential for a rivalry to break out in 2019. These drivers have never mentioned each other on Twitter — not even once. Interesting, considering they’re teammates in 2019. Look out for fireworks. Former teammates, Daytona 500 winners, and veterans of the sport haven’t yet interacted on Twitter? The rivalry’s going to erupt this year. Maybe they just haven’t encountered each other on the track yet. When they do, tempers will flare. An unspoken rivalry of the much-hyped rookie phenoms in two different decades. Soon, they’ll clash, and heads will roll. Somebody’s cramping the other’s bright-yellow-car style. What will spark this inevitable fight in 2019? These former lower-level national series champions with one Cup win on large tracks have more in common than they might think. But, still, they’ve never acknowledged each other on Twitter, meaning this lack of relationship is ripe for rivalry. It’s hard to think of two drivers with less in common. Maybe they’re secretly best friends off the track and don’t address it on Twitter. Or, there’s unavoidable strife. Somebody’s in for a long rookie season. Interestingly, Paul Menard and Jimmie Johnson have never mentioned each other on Twitter. Not even once. Sure, a reasonable person could justify such hostility by saying Paul Menard isn’t on Twitter, but it’s more entertaining to fabricate something from nothing. 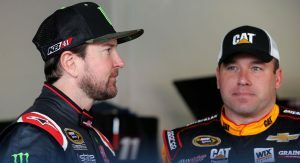 Following the path of bearded vitriol, it’s worth nothing neither Menard nor Johnson has tweeted each other since Sunday’s last-lap contact in the Advance Auto Parts Clash that sent Menard’s Ford to the junkyard and Johnson’s Chevrolet to Victory Lane. A rivalry is born? See if you can find a pair of rivals we missed based on our complete data table.